The first day of the 2-day test kicked off with a session scheduled for two hours from 9:30 AM. The session started with half-wet track caused by the rain from the night before, but the track dried up pretty quickly. Finishing first and second at the season opener, the eye-catching Nissan GT-R was applied the Special Adjustment of Performance in accordance with the Series regulation, which enforced all GT-Rs to carry 50 kg weights, but that did not seem to affect its momentum; No.22 MOTUL AUTECH GT-R (Michael Krumm/Masataka Yanagida) recorded the fastest time at 1 min 35.444 sec. The No.22 car left its front-fender unpainted with its carbon exposed in black color. They looked to be testing new parts for aerodynamics. Despite the extra weight, Yanagida indicated some improvements in the car, "We are testing various parts and items. We are in the process of checking the data of the aero parts, but it didn't feel bad to me. Michael went for the fast laps when the track dried up. 50kg of weight would be indeed tough though... We will just concentrate on one race at a time and would like to show off our strength and speed." GT-R kept its speed in the afternoon session starting from 2:30 PM. Matsuda at the wheel of No.12 CALSONIC IMPUL GT-R (Tsugio Matsuda/Sebastien Philippe) recorded the best time at 1 min 34.878 sec. No.22 GT-R and No.3 YellowHat YMS TOMICA GT-R (Ronnie Quintarelli/Naoki Yokomizo) were listed second and third in the time sheet, respectively, resulting in GT-R dominating from first to third place of the day overall just like the qualify of the season opener. No.100 RAYBRIG NSX wrapped up at fourth and three other NSXs followed behind. For SC 430s, No.38 ZENT CERUMO SC430's 10th place at 1 min 35.382 sec was the top among the fleet. It became a petty anxious first day of testing for Toyota en route to the next round in Okayama as well as the third round at Fuji, the home track of SC430. Afternoon session started at 2 PM with light rain shower falling on the track right after the start. Fortunately, clear sky showed out in the clouds after some while, enabling the session to be run in dry-condition despite the clouds. About an hour into the session, No.100 RAYBRIG NSX bettered the time that No.12 GT-R had recorded the previous day with 1 min 34.333 sec. And then, No.32 EPSON NSX lapped at the best with 1 min 34.299 sec which put NSXs on the first and second place on the timing monitor. No.3 YellowHat YMS TOMICA GT-R (Ronnie Quintarelli/Naoki Yokomizo) with 1 min 34.337 sec was at third place. No.38 ZENT CERUMO SC430 with 10th best time overall at 1 min 35.048 sec was the leader among SC430s. 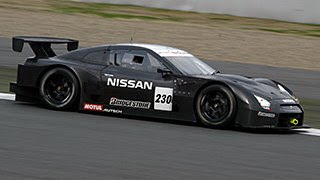 NISMO's development car, No.230 GT-R, only made about 10 laps the day before, but showed good runs today. 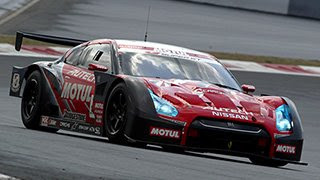 NISMO General Manager Kunihiko Kakiomoto explained, "We had a gearbox problem yesterday so we couldn't run very much. We are working around the aerodynamics mainly on the load rack for Fuji spec. We are positioning the car as advanced development car, and we have (tests for) next year too, so we are trying many things on the car comprehensively as we lack data as well as field testing at Fuji Speedway."